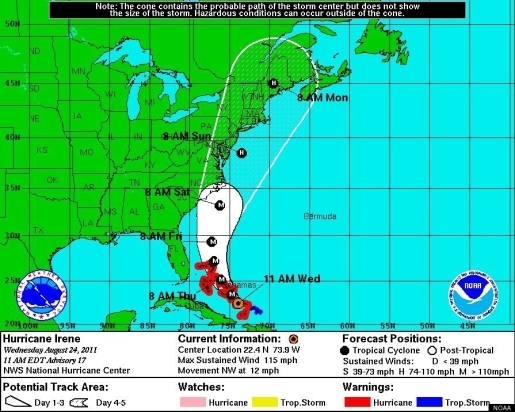 The projected path of Hurricane Irene threatens the whole of the East Coast. Residents of North Carolina are officially staring down the barrel of a gun named Hurricane Irene, and wisely, quite a few of them have decided to flee the beaches and head to higher ground. Hurricane Irene, now a Category 3 hurricane, is expected to hit the North Carolina coast by Saturday and already, people are evacuating. Dare County, North Carolina, home to Kitty Hawk, has issued a mandatory evacuation order for tourists, but residents are running for the hills as well. Carolina residents are no strangers to hurricanes, having a run-in with Hurricane Earl last August. Now, they’re preparing for another one. I guess the vaunted US hurricane shield has officially left the building, eh? As for Irene, after North Carolina, she is expected to scrape her way down the eastern seaboard of the United States, hitting earthquake-rattled Washington, D.C., New Jersey, Pittsburgh, New York City, and the entirety of the Northeast. Looks like it’s going to be a long week for everyone in the hurricane’s path. Good luck, guys.